Be sure to check out VMware KB 67416 before upgrading to 6.4.4. If you are planning to upgrade to NSX 6.4.4, be sure to have a look at VMware KB 67416 before you do. I’ve seen several customers hit this issue now, and a bit of pre-work before the upgrade can save you a lot of grief. It appears that if you are using grouping objects, like security groups or IP sets in your ESG firewall rules, there is a chance that your ESG will become unmanageable after NSX Manager gets upgraded to 6.4.4. Most customers will notice this issue when they go to upgrade their ESGs as part of the upgrade process and the tasks fail. In addition to not being able to upgrade the edge, all configuration changes you attempt to make will also fail. This issue lies in the message bus communication channel between NSX Manager and the ESG. These security groups and IP sets trigger a large number of messages and eventually the channel becomes blocked as a result. Unfortunately, there is no workaround aside from removing these groups and IP sets from the firewall before upgrading. This may not be a feasible workaround for the majority of customers out there. Although not a common configuration, this issue can also be triggered if DFW rules are applied to ESGs and these rules contain grouping objects. If you know your environment is configured with security groups and IP sets in the edge firewall, I’d recommend reaching out to VMware technical support prior to beginning your upgrade. Support can proactively install a “hot patch” so that you won’t hit this problem. If you have already hit this, the same hot patch can be applied to get you back up and running. In order for the patch to work, the ESG would have to be re-deployed leading to a brief outage. Obviously getting in front of this issue is a better plan than being reactive. VMware will be updating the 6.4.4 release notes to reflect this. The nenic driver versions prior to 1.0.11.0 may cause an outage during NSX upgrades. If you are planning an NSX upgrade in a Cisco UCS environment, pay close attention to your ‘nenic’ driver version before you begin. The nenic driver is the new native driver replacement for the older vmklinux enic driver. It’s used exclusively for the Cisco VIC adapters found in UCS systems and is now the default in vSphere 6.5 and 6.7. We’ve seen several instances now where Cisco VIC adapters can go link-down in an error state during NSX VIB upgrades. It doesn’t appear to matter what version of NSX is being upgraded from/to, but the common denominator is an older nenic driver version. This seems to be reproducible with nenic driver version 1.0.0.2 and possibly others. Version 1.0.11.0 and later appear to correct this problem. At the time of writing, 1.0.26.0 is the latest version available. Before you upgrade your drivers, be sure to reach out to Cisco to ensure your firmware is also at the recommended release version. Quite often vendors have a recommended driver/firmware combination for maximum stability and performance. I expect a KB article and an update to the NSX release notes to be made public soon but wanted to ensure this information got out there as soon as possible. Thinking about upgrading to NSX 6.4.0? As I discussed in my recent Ten Tips for a Successful NSX Upgrade post, it’s always a good idea to do your research before upgrading. Along with reading the release notes, checking the VMware compatibility Matrix is essential. From an NSX upgrade path perspective, you’ll be happy to learn that any current build of NSX 6.2.x or 6.3.x should be fine. At the time of writing, this would be 6.2.9 and earlier as well as 6.3.5 and earlier. NSX upgrade compatibility – screenshot from 1/17/2018. On a positive note, VMware required a workaround to be done for some older 6.2.x builds to go to 6.3.5, but this is no longer required for 6.4.0. The underling issue that required this has been resolved. From a vCenter and ESXi 6.0 and 6.5 perspective, the requirements for NSX 6.4.0 remain largely unchanged from late 6.3.x releases. What you’ll immediately notice is that NSX 6.4.0 is not supported with vSphere 5.5. If you are running vSphere 5.5, you’ll need to get to at least 6.0 U2 before considering NSX 6.4.0. Recommended: 6.0 Update 3. vSphere 6.0 Update 3 resolves the issue of duplicate VTEPs in ESXi hosts after rebooting vCenter server. See VMware Knowledge Base article 2144605 for more information. Recommended: 6.5 Update 1. vSphere 6.5 Update 1 resolves the issue of EAM failing with OutOfMemory. See VMware Knowledge Base Article 2135378 for more information. Note: vSphere 5.5 is not supported with NSX 6.4.0. It doesn’t appear that the matrix has been updated yet for other VMware products that interact with NSX, such as vCloud Director. Before rushing out to upgrade to NSX 6.4.0, be sure to check for compatibility – especially if you are using any third party products. It may be some time before other vendors certify their products for 6.4.0. Stay tuned for a closer look at some of the new NSX 6.4.0 features! 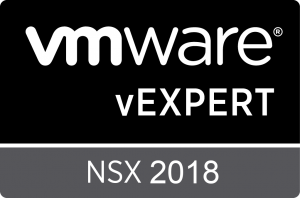 As you’ve probably noticed, VMware is regularly releasing new NSX versions and updates to introduce new features and to improve stability and scalability. Eventually, you’ll find yourself in a situation where you’ll either want or need to upgrade. Maybe you want to take advantage of some new features, encountered a problem or your version isn’t supported any more. Whatever the reason, and whatever the version, here are ten tips that will help to ensure your upgrade is successful! Before getting started, you’ll want to thoroughly check the compatibility of your target NSX version. That doesn’t just mean checking if you can upgrade from version X to version Y, but rather to check everything that interacts with NSX in the environment. Start with the NSX Upgrade Path found at the VMware Interoperability Matrices page. There you may be surprised to find that there are several versions of NSX that are not a feasible upgrade path. For example, you can’t upgrade from NSX 6.2.8 to 6.3.2, nor can you upgrade from 6.2.6 to 6.3.1. Taken from the NSX Upgrade Path on VMware’s website. Once you’ve confirmed that your target version is supported in the upgrade path, you’ll want to look at the Interoperability Matrix to ensure products like vSphere and Cloud Director are compatible. Again, there are several incompatible releases that you may not expect. For example, NSX 6.3.3 and later releases aren’t compatible with vCenter Server 6.0 U1 and older, but are compatible with all releases of 5.5. Another example is the initial release of vSphere 6.5. Only 6.5a or later can be used with any version of NSX 6.3.x. Check NSX 6.2.x Compatibility Before Upgrading to 6.3.5! Screenshot taken from the VMware Interoperability Matrix site. I expect that VMware will update the 6.3.5 release notes and release a new KB article very shortly. I’ll provide some more detail when that is out. In the meantime, please be sure to heed the version requirements or you will most likely run into problems. Thankfully there aren’t too many customers still running these old releases of 6.2.x, but if you have already attempted the upgrade and hit problems, you’ll need to roll back. If you took a cold-snapshot of the manager or a clone, you can roll back that way. Otherwise, you’ll need to deploy the original 6.2.x OVA again and restore your FTP backup. Important: If you are upgrading NSX 6.2.0, 6.2.1, or 6.2.2 to NSX 6.3.5, you must complete a workaround before starting the upgrade. See VMware Knowledge Base article 000051624 for details. VMware calls it a “workaround” but it’s basically just upgrading to an interim version before going to 6.3.5. In KB 000051624, VMware recommends going to 6.2.9 as that workflow has been tested. I.e. upgrading from 6.2.0 to 6.2.9, and then to 6.3.5. On a positive note, you only need to upgrade your NSX Manager to 6.2.9, no other components need to be upgraded before proceeding on to 6.3.5. If you attempt an upgrade from 6.2.2 or older releases, my understanding is that the upgrade will appear to be completed successfully, but your configuration will be missing. VMware calls out the remediation steps of rolling back to the previous version should you run into this issue. Author MikePosted on November 28, 2017 November 29, 2017 Categories Install and Upgrade, News, NSXTags NSX, NSX Manager, upgradeLeave a comment on Check NSX 6.2.x Compatibility Before Upgrading to 6.3.5! After procrastinating for a while, I finally started the upgrade process in my home lab to go from vSphere 6.0 to 6.5. The PSC upgrade was smooth, but I hit a roadblock when I started the upgrade process on the vCenter Server appliance. After going through some of the first steps in the process, I ran into the following error when trying to connect to the source appliance. I had forgotten that I even had Update Manager deployed. Because my lab is small, I generally applied updates manually to my hosts via the CLI. What I do remember, however, is being frustrated that I had to deploy a full-scale Windows VM to run the Update Manager service.